Recently I was quoted in an article about how you know when to change careers. I told the writer that I use a 80% guideline for work satisfaction. 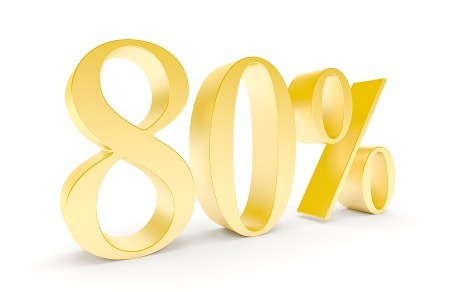 This means if a client isn’t at least 80% happy with a career, job, or boss, there is work for us to do to get that number to 80%. This doesn’t mean, however, that the goal is 95% or 100% satisfaction. I explained to the journalist that I learned through experience with thousands of clients that aiming for 95%-100% work satisfaction is a recipe for less overall happiness, not more. This is because in real life, work is not always blissful. There are routine frustrations in every occupational path. If you expect your work life to be different than this, you are probably setting yourself up for chronic frustration. Think about the people you know who are happiest in life. They are likely the ones who can tolerate some unpleasantness or keep a sense of humor in the face of small grievances, not the ones who express constant outrage because of minor annoyances. In evaluating career or job satisfaction, the key is to find or create work that is sufficiently meaningful that you are OK with some ups and downs in your day-to-day professional endeavors. If your overall work satisfaction is below 80%, you can fine tune the job you have to make it better, find a new job, or change career direction completely. Sometimes you might need a new boss or a different work schedule. Another possibility is that you need to work through some burnout to regain enthusiasm, or shift your perspective to view situations in a more positive light. If you are confused about whether you are judging your current situation too harshly or not enough so, getting some input from friends, colleagues, or an objective career expert might be helpful. Want additional tips on whether to change careers? Read 6 Signs It’s Time To Change Careers.